Accessories: a) Accompanied by the original LeCoultre presentation box with outer packaging and Jaeger-LeCoultre Extract from the Archives confirming production of the present watch in 1959.
b) Accompanied by the original Jaeger-LeCoultre presentation box with outer packaging, Guarantee dated November 7, 2011 and product literature. Historically important and technically innovative for the time, the LeCoultre Deep Sea Alarm was the first automatic diver’s wristwatch with an alarm function, the purpose of which was to remind the diver to return to the surface before their oxygen ran out. Launched in 1959, it was only produced for 3 short years, leading to a total of 1,061 examples manufactured. 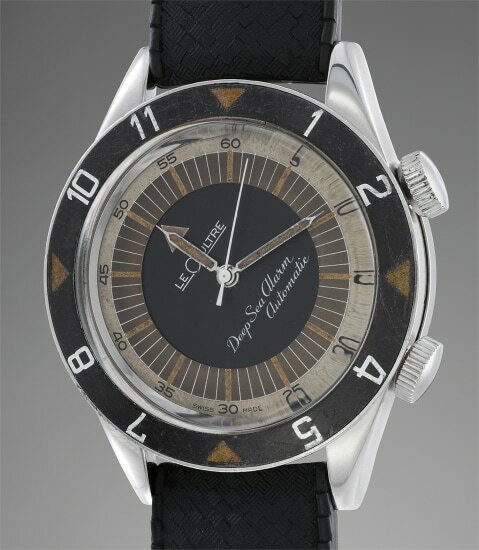 Two variants were available: one signed "LeCoultre" for the American market, and the other with dial signed "Jaeger-LeCoultre" for the European market. Scholarship shows that the LeCoultre version, such as the present lot, is the rarest variant. From 1959 - the first year of production, the watch is in fully original condition. The dial has beautifully aged and turned to warm shades of cappuccino brown. Further adding to the appeal of the present watch is the presence of its original inner and outer presentation boxes with the statement “The most exceptional watches and clocks in all the world”. In 2011, Jaeger-LeCoultre launched a tribute lineup to commemorate the original Deep Sea Alarm model, with, again, two iterations: one for the American market with 359 examples and one for the European market with 959 examples. The second watch of this set is part of the American market pieces, featuring the “Deep Sea Alarm Automatic,” designation above 6 o’clock and the “LeCoultre” under 12 o’clock on the dial. Most importantly, this watch is numbered 77/359 paying homage to the case number of its original model and is in unworn condition with box and original papers.